This is my largest landscape yet, measuring 24" x 36". It's a combination of a couple of recent plein air pieces I did this past week. Let me know what you think. Limited palette of French Ultramarine Blue, Winsor Yellow, Alizarin Crimson, white and a dash of black. Did this plein air on my lunch break today. This creek has been very good to me. Did this view over again today. I originally did it back on April the 5th of this year. That one was my first plein air completed in one quick session. I wanted to do the scene again today to see if I have made any progress in my PA painting abilities. I know that is not a good judge of whether I'm better now than I was then, due to many things. Maybe I was really on that day and not this one. Weather conditions, etc. You can find the first version here. It's time to sell some art! Daddy needs a new pair of glasses! In case you're wondering why I paint without my glasses on...They tint in sunlight, and when that happens I can't see all the colors, so I take them off. Next pair are not going to be transitions. Did this plein air tree study tonight at Salem Park, down in the dry creekbed. Did this one at the local park this afternoon. The cabin, I believe, was built by a Revolutionary War General in the county in the late 1700's. Definitely one of the oldest buildings left in the town. Did this one at my aunt and uncle's home this weekend. This is only a small portion of their beautiful backyard. The fog was lifting as I painted this one this morning. There are some big hills lost in the fog behind this old quonset hut barn and tree. The rooftop and lights to the right are part of the local hospital property. When I started there were cows in front of me, but as I neared the foreground they all wandered off. This is another "remote viewing" "virtual plein air", but not really a PA of course. I went to Google maps and street view. Picked an area of NYC and zeroed in on this building and lot. Don't know why this one. Didn't spend much time at all looking. Just started painting what I saw. 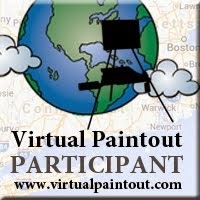 I'm thinking of doing a group paint out virtually. Pick an area of a city with definite road borders north, south, east and west, and let people choose what they want to paint within the area. Time limit of two hours or so. No peeking at the area beforehand from me or anyone else, only from the map with no street view or satellite view. Thoughts?